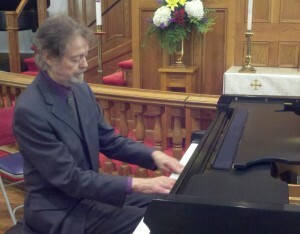 This past Sunday, we sponsored a phenomenal free concert given by our Artist-in-Residence, Dr. John Cobb. I sincerely wish that every one of you could have been there. In addition to thunderous applause, many listeners in the audience were moved to tears by the passionate dynamic expression of the music. It was the first concert for which Freeburg Pianos provided our brand new 7′ Mason & Hamlin semi-concert grand piano. The concert was broadcast live on WTZQ radio. As you can imagine, I was “bursting my buttons,” as Keith’s Dad used to say, when Keith opened the concert which was heard there and “around the world” – well, at least in the Hendersonville listening area. Thank you, WTZQ. I am always thrilled and chilled by grandiose explosions of music. I get carried away in the excitement and can barely sit still. I even get “choked up” when pianists’ fingers fly over the keys articulating every note in the wild fire runs. That’s what happened on Sunday. Thrills and chills. Let me tell you, at one point, it looked like Dr. Cobb’s fingers were floating over the keys they were flying so fast. Something else occurred during the concert. I shed a few tears, along with others, during the very, very soft final notes of a couple of pieces. Many times when the music is slow, I lose interest – kind of the “I have places to go, things to do attitude” or I am so relaxed that I fall asleep. Don’t get me wrong. I enjoy slow, quiet music but usually at home alone. However, on Sunday, Dr. Cobb’s interpretation of the quiet sections and pieces had me completely involved. A couple of times, I felt as if I was drawn up into and suspended in a “spiritual space” as I anticipated the next note which was oh so gentle but could be heard throughout the auditorium. I can still see his right hand hovering over the keyboard and then, at just the just the right moment, he caressed the final key. Shivers. Obviously, the Mason & Hamlin and Dr. Cobb were made for each other. A great piano played by a great pianist. Thank you Dr. Cobb. Another thing I love about hosting these concerts is the opportunity to “meet and greet” people. Some of them were brand new friends. Others were people I have talked with multiple times over the more than thirty years I’ve been scheduling Keith’s tunings but never met. It thrills my heart to meet these wonderful people face-to-face. One precious woman told me that she reads my blog. Thank you, Gail. Keith and I have always been “all about people,” loving and serving them through the vehicle of music, specifically pianos. Now, we have a wonderful team of people working with us who are all about that, too. What a joy! Thank you, Team. Thank you everyone who attended. We have more concerts coming. You can see our schedule on the “Event Calendar.” We’d be happy to send you announcements if you let us know your e-mail address by going to the contact page and sending us an e-mail or giving us a call at 828.697.0110. We were there Sunday (our second at that church) and loved every minute. John never fails to entertain brilliantly and Alexander amazed.